Wilde was interviewed by an avid press while still on board. He told the New York Sun that he was disappointed in the Atlantic, a sentiment he repeated about Niagara Falls, and one that was much publicized and ridiculed. It was also on this occasion, while at Customs, that Oscar Wilde is reputed to have made one of his most oft-repeated quotations: that he nothing to declare except his genius. But did he really say this, and what is the source of the quotation? Upon arrival Wilde visited a hotel, but soon took a private apartment for solitude to continue his work away from a hounding press. In an interview with the Boston Globe he said, ‘In New York there were about a hundred [reporters] a day. I had to leave my hotel and go to a private house when I wanted to push along my work’. It is not clear whether Wilde checked out of his hotel or used the house intermittently. 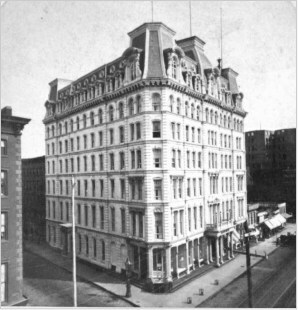 While no contemporary record has yet been found establishing Wilde’s hotel, it was likely to have been the Grand Hotel, a building which is extant at 31st Street and Broadway. This assumption comes from the early (although sometimes unreliable) source book for Wilde’s tour of America Oscar Wilde Discovers America: 1882 in which the desk clerk, reportedly a Michael Toner, gave details of Wilde’s arrival and stay to the authors in preparation for the book, albeit over 50 years after the event . Further, Wilde did, in fact, stay at the Grand in both February and May of that year on return visits to New York City. A counter to this assumption is a report of Wilde’s landing  which states that Wilde’s arrival party ‘drove off to the Brunswick Hotel’, although this may have been only for breakfast. In 1882 New York was a gas-lit city of a million people living through a time of growth that encompassed the gentrification of a commercial district around the Ladies’ Mile, and residential displacement as the city’s wealthy moved uptown. The Statue of Liberty was not yet in the harbor, the Brooklyn Bridge was still being constructed; the tallest building was Trinity Church. Such was Wilde’s milieu. 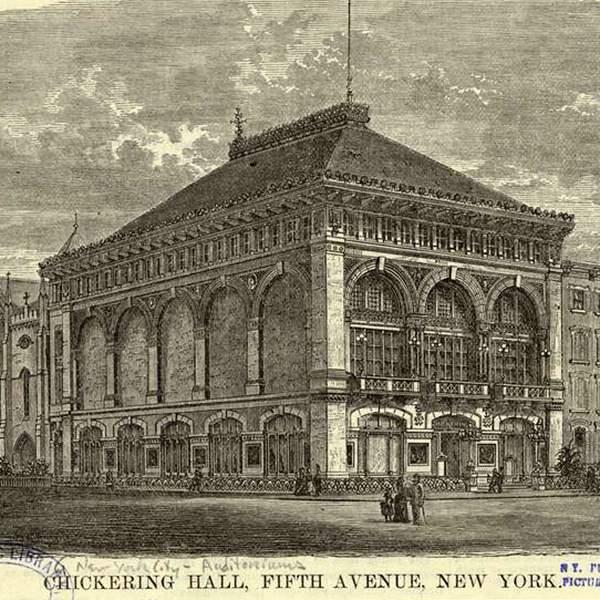 With his first lecture on January 9th at Chickering Hall thus began an almost year-long lecture tour of America. Boston Globe, January 29, 1882, 5. New-York Tribune, Jan 8, 1882, 7. The Writings of Oscar Wilde (A.R. Keller & Co., 1907, 76), Ch. IV American Lectures by W.F. Morse. Oscar Wilde Discovers America, Lloyd Lewis and Henry Justin Smith, 1936, p.35. New York Evening Post, January 4, 1882, 4.